Hydrostatic Test Pump. 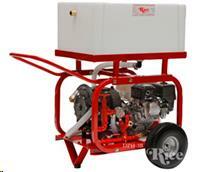 The DPH-3B is a large volume medium pressure hydrostatic test pump. Designed to allow handling of up to a 10% chlorine solution, recommended for testing water lines up to 24" in diameter. Options available include a wheel and handle kit for portability, and a 20 gallon pressure feed reservoir tank. * Please call us for any questions on our hydrostatic pressure tester rentals in Chagrin Falls, Cleveland Heights, Eastlake, Elyria, Lakewood, Lorain, Mayfield, Brunswick and Painesville OH, serving Northeast Ohio.